Star Trek Enterprise previously available as a sold-out Internet exclusive-- is coming back for a limited time! The Star Trek All Good Things USS Enterprise D Ship is from Star Trek: The Next Generation. USS Enterprise-D has a third nacelle, as seen in the "All Good Things" finale. The most detailed Enterprise toy ever released! The Star Trek All Good Things USS Enterprise D Ship was previously available as a sold-out Internet exclusive, but is back for a limited time! The Star Trek Enterprise commanded by Admiral William Riker in the Star Trek: The Next Generation series finale, the ship features a unique third-nacelle design with more firepower than the previous Enterprise. It also includes sound effects and phrases unique to the "All Good Things" episode. 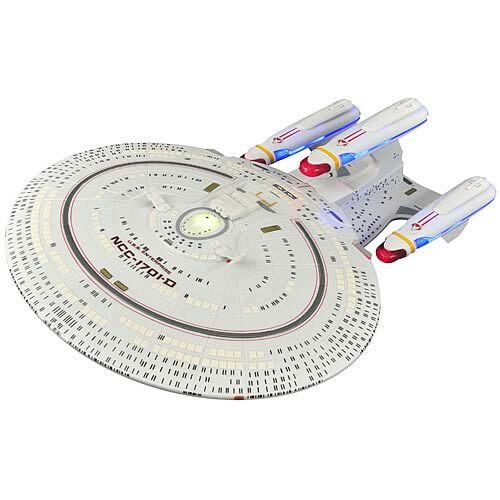 With exacting detail, full lights and sound effects, and a removable saucer section, this Star Trek Enterprise Ship measures over 17-inches long and is the most detailed Enterprise toy ever released!